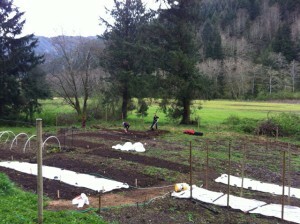 We started out a few months ago clearing another 20 beds for vegetables. The good news: you can do it in the rainy season, when it’s still too cold to plant anything. The bad news: you have to do it in the rainy season, when it’s still too cold to plant anything! 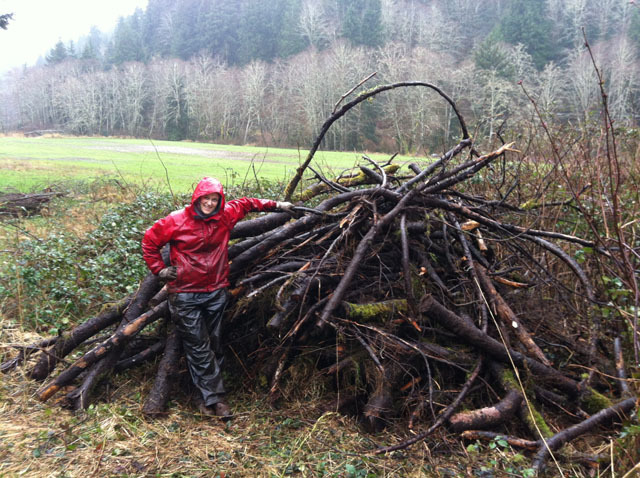 Days of cold, wet, muddy toil passed as we cleared invasive wild blackberry, hauled off downed timber, cut sod, and double-dug earth. 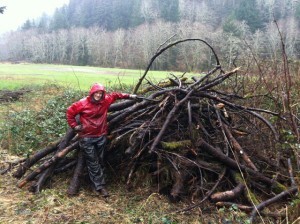 Here is Emily standing next to one of the debris piles we made. While all that was going on, in the evenings we were planting flats of seedlings. They sit in our living room for the first few days to get them warm enough to germinate (next year: heat mats!) and then they move out to the mini-greenhouse for a few weeks, waiting for the “last frost” date of May 1 to pass, when it’s supposedly safe to set them out. Some of the particularly fragile plants, like tomatoes, spend extra time in the greenhouse. This year, we borrowed some greenhouse space from our friends Anthony and Victoria; our plans to build our own greenhouse were set back this year. Their greenhouse is pretty small, though, so we are only growing cherry tomatoes- they can be set outside earlier in the season, and ripen quickly enough that they will beat the first frost of fall. Our original plan for this year was to build our own greenhouse, big enough for several varieties of tomatoes and peppers to be in there the whole season, but it didn’t work out financially. We fretted over it for week, then realized that if we didn’t have tomatoes and peppers at the market, several of our neighbors would, and no one would really notice. 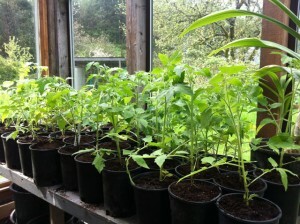 Next year… Here you can see our lovely tomatoes right after they were transplanted to larger pots. We actually sprouted far more than we need, expecting some loss, but they are doing really well. I think I am going to sell the ones we don’t plant as starts at the first market of the season. Hmm, maybe I should plant a loot of extra ones next spring? We’ll see how they sell. 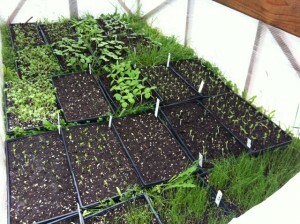 With May 1 past, it was time to take the seedlings out to the fields. 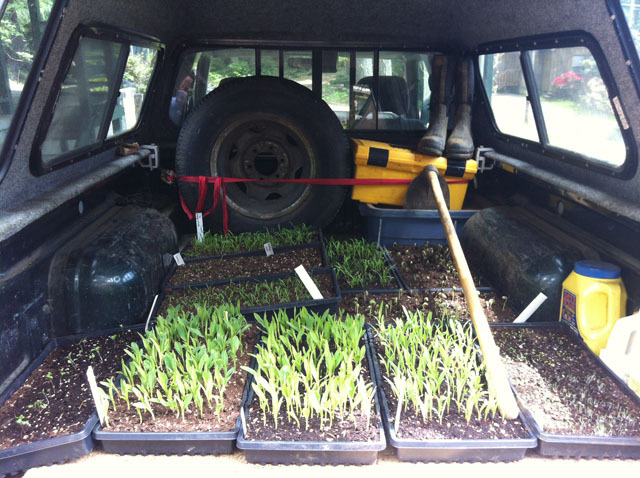 Here we see some happy little plants going for a ride in my pickup. I haven’t found a way to seat belt them in yet, but I would if I could! They are precious and fragile. Once we have them to their new home, they get planted with care in one of the raised beds. We have enough beds now that we can allot separate (or multiple) beds to each type. We’re growing a lot of stuff this year, but the main items are broccoli, potatoes (four varieties), romanesco, cabbage, beets (three varieties), corn (four varieties), greens, onions, garlic, herbs, cucumbers, squash (four varieties), beans (five varieties), peas, carrots, pumpkins (two varieties)… hmm, what else? I’ve certainly forgotten something. Being past Last Frost isn’t actually a guarantor of success, however. A few really cold, drizzly days early on wiped out a few of our plants (Crooknecks squash, Marketmore cucumbers, and some of the pumpkins) so we reseeded them and added row tunnels to protect the rest until the heat comes back for real. Turns out, even cold-loving plants like broccoli can benefit from a tunnel; here we see the little broccolis growing happily under their cozy cover. 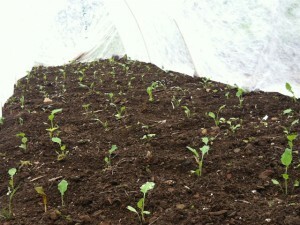 Another bed of broccoli a few feet away had no tunnel, and they are growing about half as quickly as these. So much to learn. 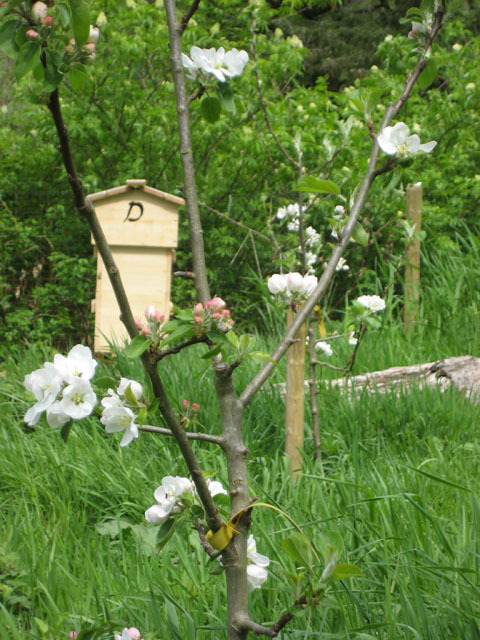 The orchard has awakened as well. Even thought we’re just in our second year, several of the trees decided to bloom this time around: Gravenstein and Chehalis apples, Moonglow pears, several plums, and the cherries. I’m not expecting much fruit this year, but even getting just a few starters for personal enjoyment would be fantastic. As part of the care of the orchard, we spray four times a season with an organic fertilizer/ protectant I read about in an orchard management text. I mix it up from liquid fish, neem oil, and a little bit of castille soap. It has a sort of funky smell, but is supposed to really make a difference. I guess we’ll find out. A few days ago, I was in the orchard and noticed that three of my trees had suddenly turned black and died. NOT A GOOD SIGN. I can’t figure out the cause, as too many variables were changing at once… in the previous week, I’d both sprayed and weed-wacked the orchard, and we’d had a really damp week of solid rain and cold. Could it be physical damage? Shock? Fungus? Ugh, the trials of being an orchardist. We’re also expanding our apiary. 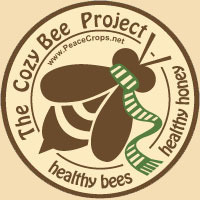 This year, I ordered package bees in stead of nuc hives- the difference is that with a “package” you don’t get any comb or brood. 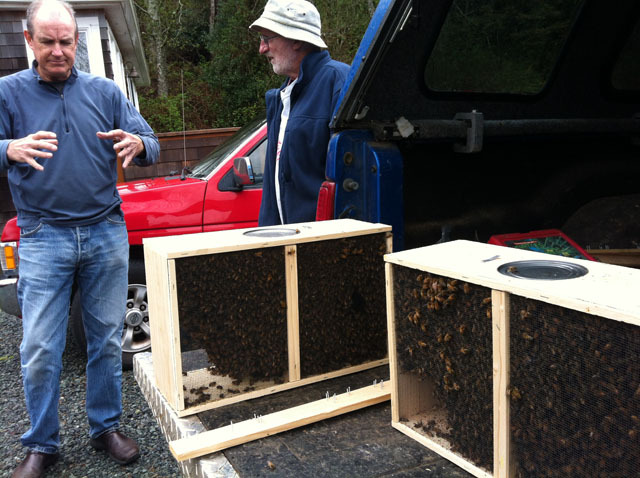 Here are my 90,000 bees sitting on the tailgate of Bob’s truck, with another beekeeper friend of mine in the background describing what his bees were doing last week. Packages are a little trickier to manage at first, but you have several advantages: less disease possibility, they build faster, and you get new, clean comb out of it. I ordered two types of bees, Carniolan and Italian, so it will be interesting to see if there is a difference in how they perform. It’s also swarm season right now, and I went out yesterday to leave a “bait hive” under a swarm 15 feet up in a tree at a neighbor’s farm. Hopefully, they’ll move into it and I’ll get yet more bees. 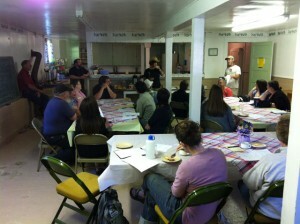 The Farmer’s Market season is set to start June 15th, so we’re really pushing to have produce ready by then. Once we get everything in the ground, it’s time to start thinking about the business end- how we’re going to handle the produce, what we need to set up the stand, what sort of incidentals to get. I’m thinking of ordering some stickers of our logo, in part for general marketing, but also to use to identify our equipment. Our friends in a band do that, and it works pretty well for them. And we want to be the rock stars of farming, so why not? Here’s a picture of the kickoff meeting for the Manzanita Farmers’ Market vendors, where we talked about hours, policies, setup, and all that sort of stuff. Market vendors are a fun group, and there’s a sort of community to it, much like I imagine it would be like to be in the circus. And with it being as busy as it has been this last month, I think a circus is a pretty good analogy. This entry was posted in News and tagged beekeeping, orchard, seedling, tomato, tree, vegetables. Bookmark the permalink.